A safety review of gun events across the Province has been called for as an account emerged of how a man came to lose his life at a clay pigeon shoot in Co Down. The victim of Sunday’s tragic incident has been named as Terry Fitzsimons. He is in his early 60s and believed to be from the Ballykinler area. It happened at Lough Money, to the east of Downpatrick, during early afternoon. SDLP councillor Gareth Sharvin (representing the Downpatrick area of Newry, Mourne and Down District Council), said Mr Fitzsimons’ was a grandfather and that his wife Marie (nee Warnock) had died about 12 years ago. Clay pigeon shooting involves a machine firing clay discs through the air, while competitors try to track them and shoot them down with shotguns. Councillor Sharvin said his understanding of what took place is that Mr Fitzsimons had been in a kind of cage-like structure where shooters stand before firing. Another shooter next to him had a loaded gun, fell down, and accidentally shot Mr Fitzsimons in the head. He had spoken to some of Mr Fitzsimons’ children, and said: “I don’t think it’s actually settled in, exactly what has happened. On Sunday, police said “initial enquiries would indicate this to be a tragic accident”. 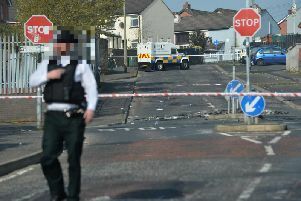 Councillor Sharvin said PSNI forensics officers had spent some time examining the scene on Sunday. At time of writing on Monday afternoon, no-one had been arrested. Clifford Barr – chairman of the Ulster Clay Pigeon Shooting Association, said he was not aware of the full circumstances of this specific incident, and was reluctant to comment on it, except to express his sympathies for those involved. He had been involved in the sport since the early 1990s, and said the only other incident he can remember of a person being shot is was when someone fired into their foot a number of years ago. Most accidents which they encounter involve the disc-firing machines, not the weapons themselves, he said. The numbers of those participating in the sport each week would be in four figures, he said. He noted that they have just finished a major contest in Banbridge, involving 400 entries over one week, with “not a single incident”. Sinn Fein councillor Naomi Bailie, also representing Downpatrick, said her “strong sympathy and condolences” went out to the victim’s family.